oh this is so pretty..oh i love this..everything about this..i love it so much..the earth that was such a good idea..with it behind them...and the swirls and the stars and everthing behind them was so pretty...and i love the text..wow..im speechless..wow..and i love the drawing your so talented..i love it..so much..its so pretty i love her dress and his outfit..and the colors you used in the background..wow..oh i love this..*smiles*. OH I love the new background so much! its so cute... :D Its my most favorite one of all! wow! really outdid yourself this time girl.. its great .. *adds to favs*. Love it. Your talent is endless my friend, endless! *---* Ok i really think this one is better than the other one, and goes to my favs right away! love the background! is amazing! the earth! your wallie has some of my idea of one o my fics, which is really weird XD it's called: "He met the Sunset" on FFN XD Love it! I still love the drawing you did so much *O* This new background is just as amazing as the first one *nods* Keep up the wonderful job, nyaa? wasnt the original for this was Lacus n Kira? well n e ways, good job! This wallpaper is just awesome. The fanart is extremely attractive! The background is amazing. love the colors and all. The whole scene is just perfect for Athrun and Cagalli. the bg is really great! Wow this one ish better than the first one, especially the background! Sugoi ne! You're really great at drawing! Whoa! (O_O) This is a redo with the You and Me you made. I actually like it better when you had clash the color with green instead of red. It fits better. Though the picture of the Earth really matched well. It's still nice overrall. WAI! KAWAII! so cute :D i love it ASUCAGA FOREVAH! This is lovely! ^.^ I love Athrun/Cagalli! It is clean wall paper. 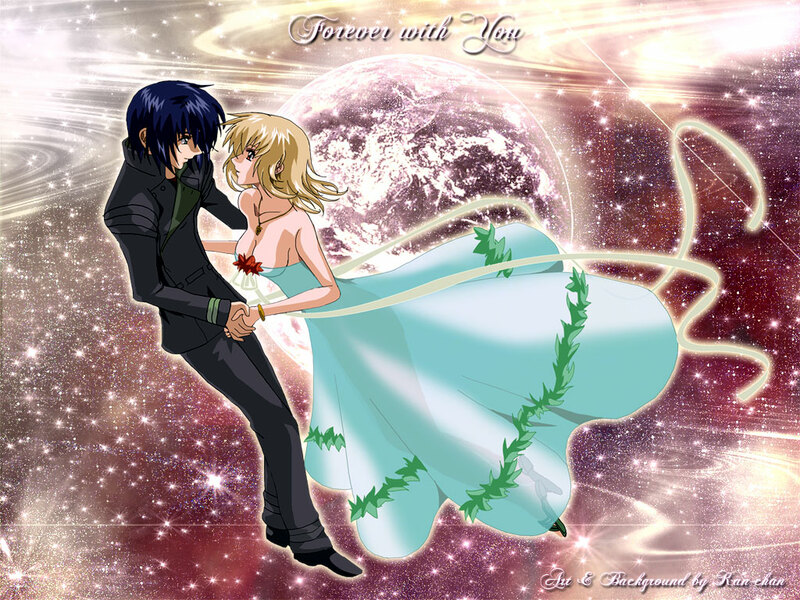 The whole scene is just perfect for Athrun and Cagalli.